Meet Craig M. Fern M.D. Dr. Fern is a native New Yorker. He earned his Bachelor of Arts degree from Emory University in Atlanta, Georgia, where he was elected to Phi Beta Kappa. He then received his medical degree from New York University School of Medicine. He completed a residency program in Ophthalmology at NYU Bellevue Medical Center, followed by a fellowship in Vitreo Retinal diseases and surgery at the University of California, Davis Medical Center. 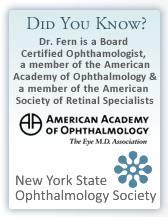 Dr. Fern is the Chief of Ophthalmology at Northern Westchester Hospital and former directer of retinal surgery at Bellevue Hospital, the main teaching hospital of New York University School of Medicine. Dr. Fern has been practicing in Westchester since 1996. 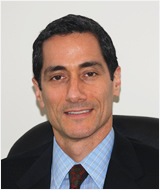 He is a Board Certified Ophthalmologist, as well as an active member of the New York State Ophthalmology Society, the American Academy of Ophthalmology and the American Society of Retinal Specialists. Dr. Fern is listed in Castle Connolly's best ophthalmologists for Westchester County.